Día de los Muertos is one of my favorite times of any year. So many artists are inspired by Muertos visuals, including my own Loteria card series. 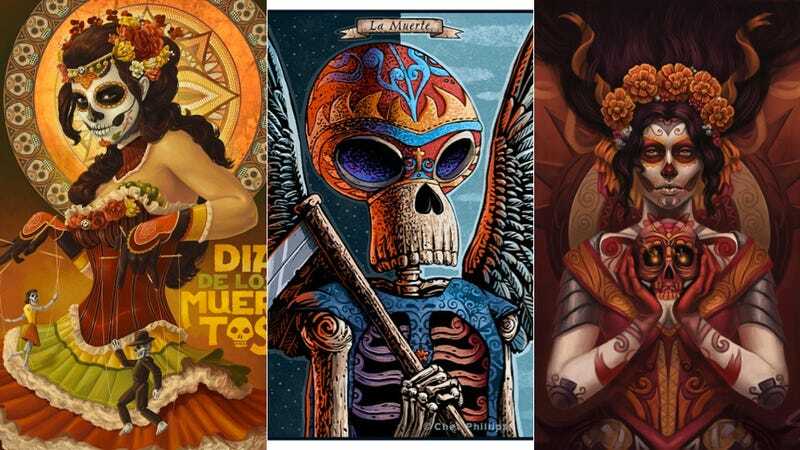 Here's a gallery of Day of the Dead-themed works from artists across the contemporary science fiction, fantasy, and genre art spectrum. Art by Charlie Bowater. Imagine FX first commissioned this piece, and it's a knockout. I especially like those little echoes of the lace in the background. Art by Alix Branwyn. She calls this her "first Catrina design", and that's an homage to Jose Guadalupe Posada's original "La Calavera Catrina" drawing (circa 1910-1913). Posada's infamous cartoon criticized Mexican natives who aspired to imitate European style, while forsaking their cultural heritage. Art by Chet Phillips. I love this chimp-faced icon. It seems as much inspired by Loteria as anything else. The patterning on the skull and shoulders makes me want to see someone cosplay this at a Day of the Dead festival. Art by John Picacio. I included this one by me because before I finished 'La Calavera', this was my best tribute to the Day of the Dead. It's an oil painting on masonite, surrounded by flowers, ephemera, and photos of my grandparents, all housed in a custom-made box. Light the candles, photograph the assemblage — and voila —there's the cover art. Commissioned back in 2001 by The San Antonio Current. Art by Sara K. Diesel. This is one of my favorite Muertos-inspired artworks by any artist, bar none. Dynamite design work too. Sara's thoughts: "This is called 'Lady of the Dead', and it was inspired by the deity Mictecacihuatl. She was the Aztec Queen of the Underworld and she ruled over the afterlife, overseeing many Aztec rituals, while watching over the bones of the dead." Art by James Jean. It's the cover art for My Chemical Romance's album "The Black Parade", and if there's ever a Día de los Muertos procession as gorgeous as this one, I need to be there. Art by Kat Caro. There might not be an obvious sf/f angle to Kat's Blythe dolls, but wow, they're compelling and soooo creepy beautiful. I couldn't help but include one of these. Art by John Picacio. My 2014 Loteria calendar featured the initial version of this artwork, and I could never shake the urge to do a better version. I started over from scratch, re-drawing and re-designing it. I finished this new version this week, and those demons have now been put to rest. Available until October 22nd as a signed poster, along with my limited-run Loteria posters for 'La Luna' and 'El Corazon'. Art by Mab Graves. I recently saw her work for the first time, and I'm ashamed I hadn't seen it sooner. Powerful, iconic work. I love this piece and whoever framed it deserves applause as well. Art by Jose Pulido. Star Wars Calaveras? Yes, please. Art by Todd Schorr. This one's called "Madame Calivera's Corporate Identity Program". From his book Dream Land, "Guarded by her hyperphallic gnome servant, Madame Calivera — making no 'bones' about her role as death's deputy — puts two cherubic yuppies through her flaming hoop of nine-to-five, stock-options greed, whereupon only too late do they see the mechanized maw of industry ready to swallow them up forever." Genius. Art by Paul Sullivan. This is concept art for THE BOOK OF LIFE, an animated film directed by Jorge Gutierrez, produced by Guillermo del Toro. Paul spent five years working on it, art directing and designing along with Simon Varela and Jorge's wife, Sandra Equihua, who designed characters for the film. I can't wait to see it this weekend. Unknown artist. These are called 'Skele-Treks.' They speak for themselves, don't they? If someone knows who designed these, I'd love to credit them! Follow John Picacio on Twitter and Facebook.